Doggie play land, sandbar beach in Hood River. Home of surf dogs. Kiter dogs. Windsurf dogs. SUP pups. The human and canine kind. 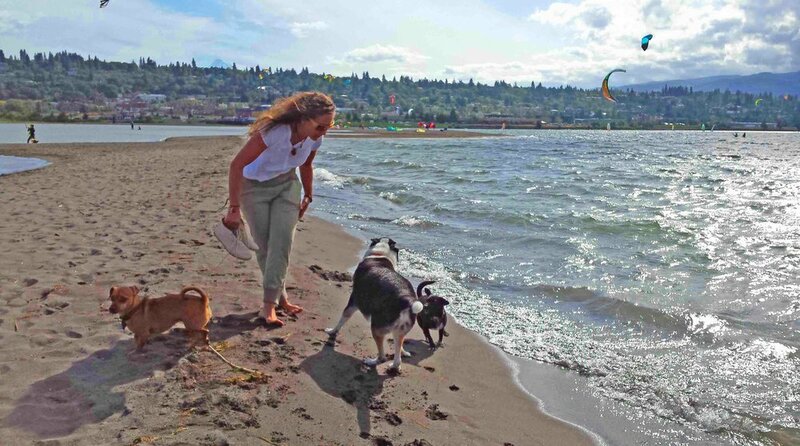 Here in Oregon, dogs and dog people play on a slice of sandbar paradise at (where else?) Dog River. The sandbar is a little small this year - it's barely a thong bikini of sand, due to high river flows. But she is our own - our Oregon Dog Beach. In our remarkable inland surf community. On our historic Columbia River. Where dogs and dog people play. And later in the day, when the wind blows, kite surfers, windsurfers and SUP pups take over the water and sand. 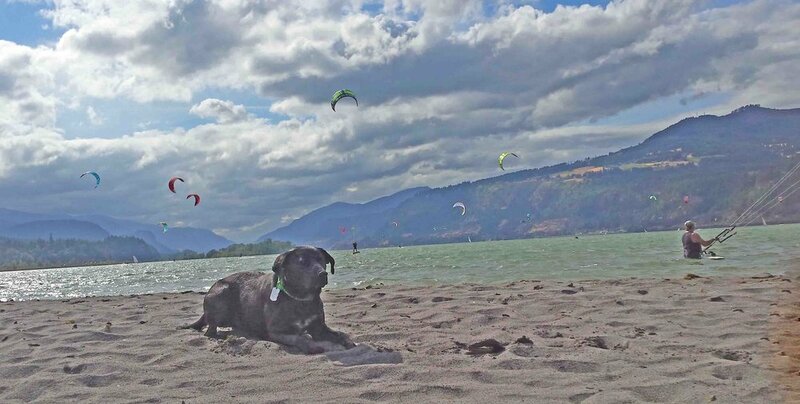 Here's a day in the life of our own secret sandbar... home of kiters and windsurfers and paddlers-- people and pets - all breeds and all creeds. Hood River is the remarkable place we call home. This is our Dog Beach, our Dog River. Cross roads of the surf dog universe. Here in the Columbia River Gorge National Scenic Area, snow melt from our own Matterhorn, Mount Hood, rushes down spectacular cliffs that jut up around the Columbia River. That river flowing from Mt. Hood is called (duh!) Hood River. But it's real name, it's first name, was Dog River. Of course it was. The crossroads of that magical, mystical, historical Dog River as it met the magical, mystical, historical Columbia River, the river of Lewis and Clark, is where the Dog River sandbar formed. Dog River was and is the lifeblood of a tiny town that grew up around it with the same. But white settlers in the 1800's didn't think the name was glamorous enough. So in 1858, Dog River became Hood River. 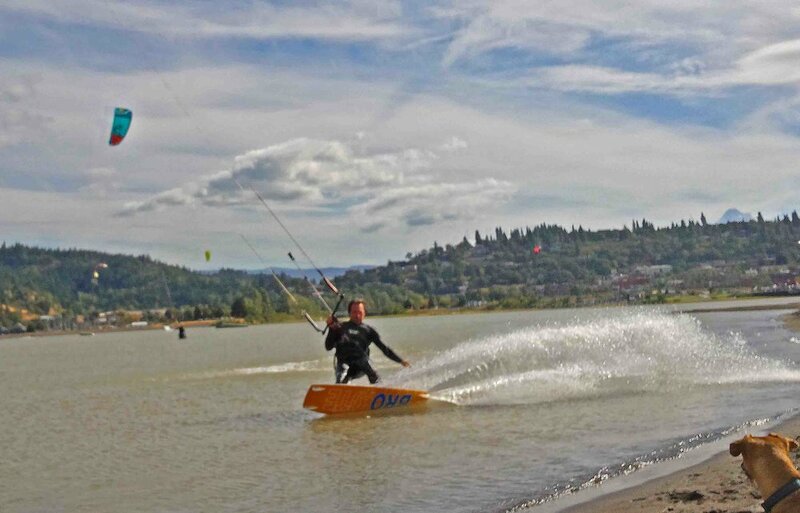 130 years later, the rural farming town of Hood River became epicenter of the Columbia River Gorge tourism, and famous for windsurfing and extreme sports. The Dog River/Hood River sandbar, the beach that never was, grew to a full blown dog beach destination when Ma Nature went a little crazy in a mega storm, November 2006. Dog River /Hood River poured 800,000 cubic yards of dirt and rock and trees from Mount Hood into the Columbia River. 153 million gallons of sand - 26 new acres added to Dog River sandbar! Cowabunga Oregon paddlers, surfers and beach dogs! The other Dog Beach - the original - in So Cal. 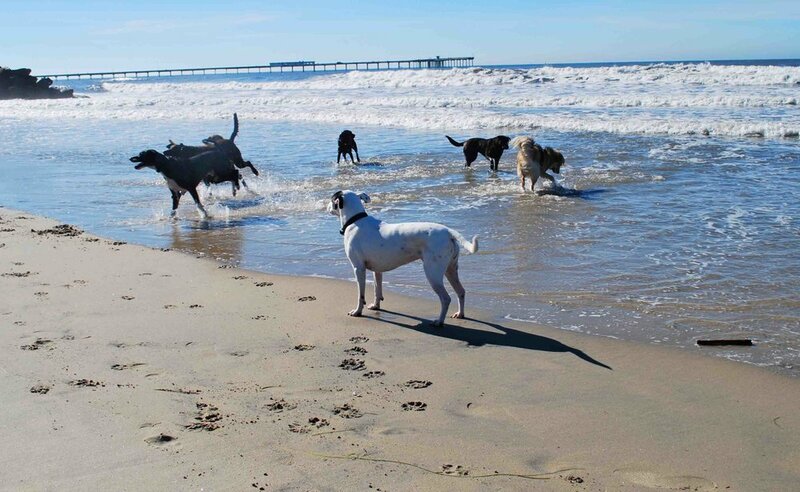 San Diego beach dogs hang out at the original Dog Beach in Ocean Beach (OB,) a dinky dog town. That sandbar has a similar "secret beach" beginning. A mighty storm off the coast pummeled Ocean Beach with waves, and the San Diego River overflowed its banks as it rushed to the ocean. It wiped out Wonderland, a historic waterfront amusement park in the early 1900’s. That storm left other debris, too – the good kind – a new secret beach, a sandbar, claimed by dogs and their people - designated Dog Beach in 1972, one of the first leash free beaches in America. That was our old Surf Dog Diaries stomping ground - Dog Beach in Ocean Beach (OB.) Formally adopted by Ocean Beach Town Council (OBTC.) Dogs and their people jumped in with two feet and all four paws to help. My first surf dog Howdy Doody and I co-chaired the nonprofit Dog Beach Committee of OBTC for years. With co chair Dave Martin, a pack of loyal businesses and volunteers and City of San Diego support, our amazing OB community fixed up Dog Beach over the next decade. It went from beat up to “bitchin,” from 1997, the 25th anniversary of Dog Beach, 'til its dedication in 2003. OBTC continues Dog Beach improvements today. We windsurfers, kiters and campers are always on the hunt for new secret spots. Our surf dog family took a surfin’ safari from Dog Beach and found Dog River – our new doggie play land / water sports central / small town paradise. Like salmon and surfers, we migrated here. This is a magical, national scenic area - for all kinds of surf dogs. So, get out to your favorite Dog Beach. Sink your pads into sand. Chase a stick or a ball 'til your legs give out. It’s the season we’ve been waiting for!